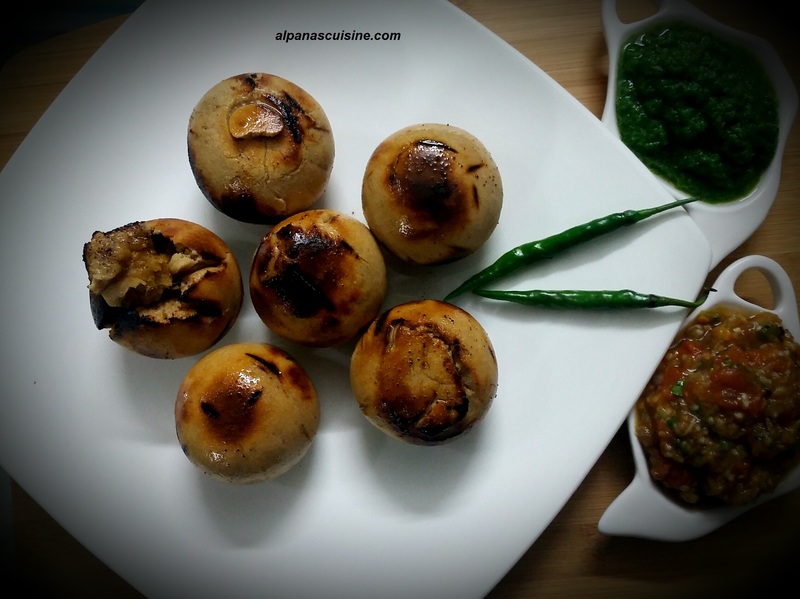 Litti Chokha is a traditional dish.It is a signature dish of Bihar.It is made with wheat flour dough, which is stuffed with Sattu(roasted gram flour mixed with spices).It is served with chokha (which is made by roasted , mashed eggplant and tomatoes).When we serve Litti dipped in pure ghee with chokha and coriander chutney ,give this dish an authentic taste.Enjoy Litti with Chokha . 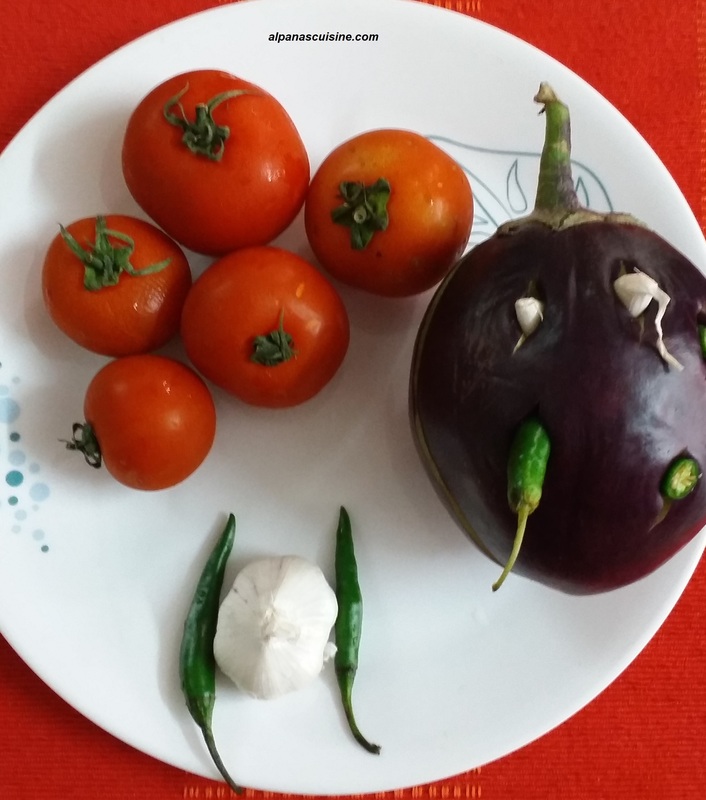 You can also try litti with mutton . FOR DOUGH : Wheat flour 400 grams,pure ghee 4 tablespoon,warm milk 1 cup,baking soda 1 teaspoon,salt to taste . FOR STUFFINGS :Sattu(roasted bengal gram flour ) Garlic 10 cloves( chopped),Ginger 1,1/2 inch( chopped),Carom seeds 1 teaspoon,Onion seeds 1 teaspoon,Green chillies (finely chopped),Fresh coriander 2 tablespoon(chopped),Mustard oil 2 tablespoon,Lemon juice 5 tablespoon,salt to taste,black salt 1 teaspoon,Pickle spices 2 tablespoon,4 tablespoon of water.Mix all the ingredients . DOUGH : Take the flour in a bowl.Put all the ingredients like ghee,baking soda,salt and warm milk ,mix well and make a soft dough(not too hard or not too soft).Cover the dough and keep aside for 30 minutes.Milk is used to make Dough Soft. 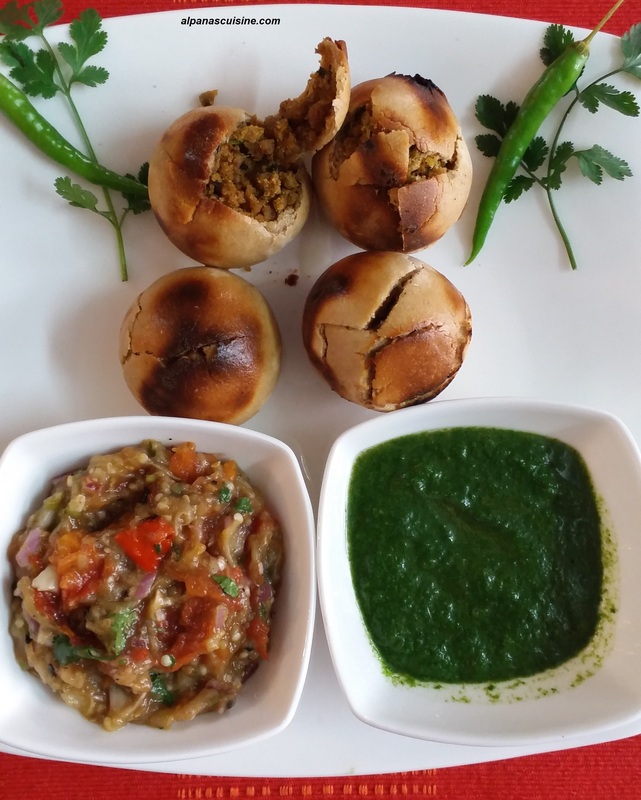 MAKING OF LITTI : Make small size balls from the dough,sprinkle some flour each dough ball and make small deep circle.Now put 2 tablespoon of stuffing in the center ,theen join the edges and make stuffed dough balls .Now litti is ready for baking or frying. BAKING OF LITTI :Place the litti in a preheated oven at 180 degree celsius for 25-26 minutes 12-13 minutes each from both sides. )Bake litti till light brown.If you want some charred spots on littis then place it on fire and rotate for few seconds.After that dipped or brush the littis in the pure ghee. Serving Style : Before serving break the hot litti and dip into melted ‘GHEE’.Serve Litti with chokha and chutney.